This color-coded map shows the strength of surface gravity around Orientale basin on Earth's moon, derived from data obtained by NASA's GRAIL mission. 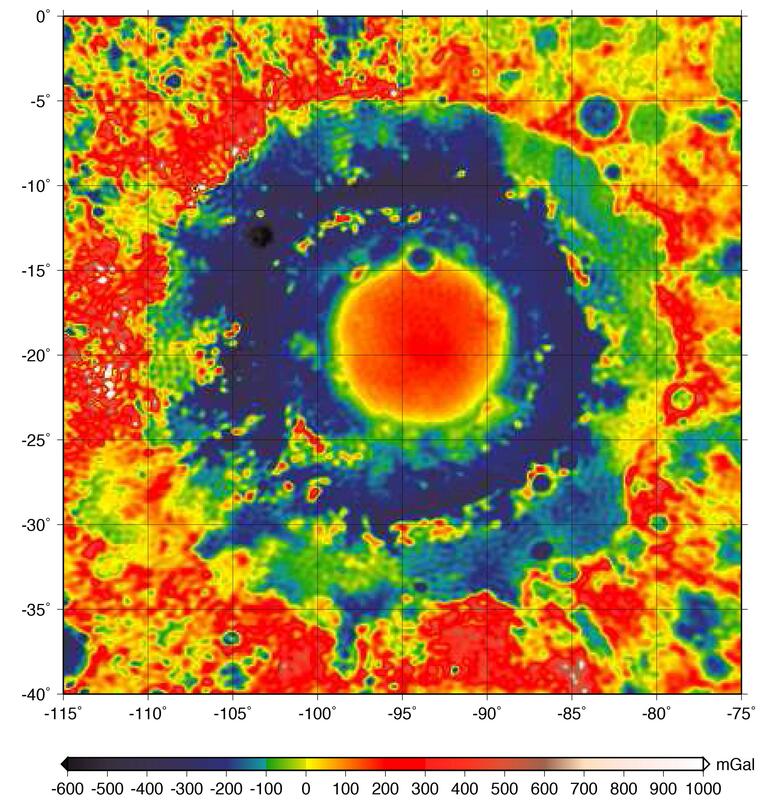 The GRAIL mission produced a very high-resolution map of gravity over the surface of the entire moon. 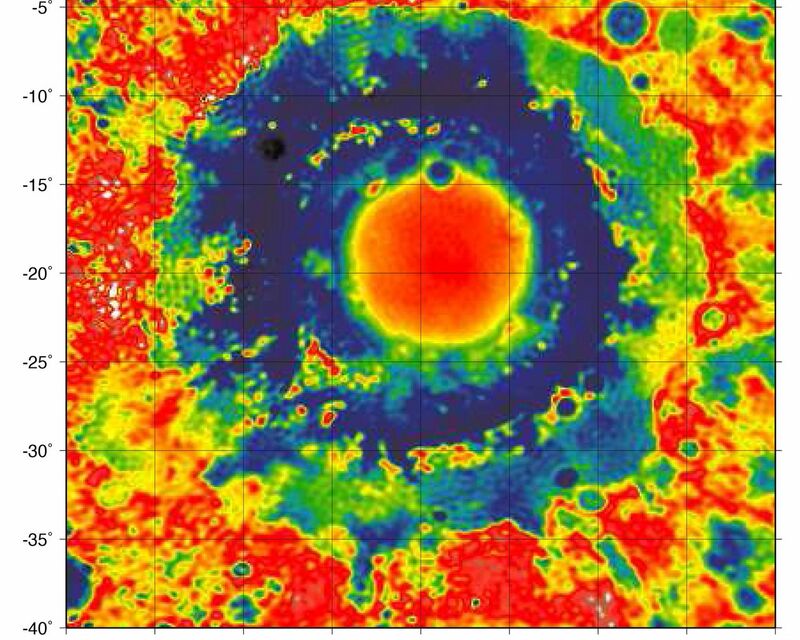 This plot is zoomed in on the part of that map that features Orientale basin, where the two GRAIL spacecraft flew extremely low near the end of their mission. 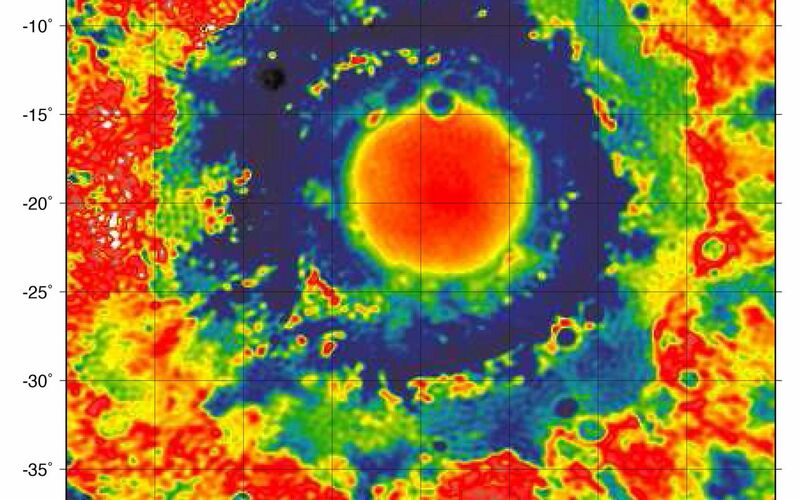 Their close proximity to the basin made the probes' measurements particularly sensitive to the gravitational acceleration there (due to the inverse squared law). The color scale plots the gravitational acceleration in units of "gals," where 1 gal is one centimeter per second squared, or about 1/1000th of the gravitational acceleration at Earth's surface. (The unit was devised in honor of the astronomer Galileo). Labels on the x and y axes represent latitude and longitude. The GRAIL mission was managed by NASA's Jet Propulsion Laboratory (JPL) in Pasadena, California, for NASA's Science Mission Directorate in Washington. The mission was part of the Discovery Program managed at NASA's Marshall Space Flight Center in Huntsville, Alabama. GRAIL was built by Lockheed Martin Space Systems in Denver. For more information about GRAIL, please visit http://solarsystem.nasa.gov/missions/grail.